Thank you to Margaret Dennis for the following research. Gordon Hargreaves Brown was born 31st July 1880 in Liverpool. His parents were Sir Alexander Hargreaves Brown Bt (a merchant, magistrate, and Liberal MP) and Henrietta Agnes Terrell, Lady Hargreaves Brown. In 1881 Gordon was living with his parents and his older sister Agnes Sarah (age 3) in Grosvenor Gardens, Knightsbridge, London. He was educated at Eton and Sandhurst, and joined 3rd Battalion Coldstream Guards in January 1900. By 1901 the family included another son Walter and another daughter Gladys Emily, and were still at Grosvenor Gardens. Gordon was then a 2nd Lieutenant in the Guards. He served with the 2nd Battalion Coldstream Guards in the South African Campaign of 1901-02. On 18th October 1910, he married Editha Ivy Pigott, daughter of Vice-Admiral W H Pigott and Edith Lloyd. The ceremony was held in the Guards Chapel, in London. Gordon and Editha lived at Broome Hall, Holmwood, Surrey. Their children were Joan, John and Patience. Gordon and Editha’s only son, Capt Sir John Hargreaves Pigott Brown Bt, 2nd Battalion Coldstream Guards, died in WW2. Husband of Editha, Lady Brown (nee Editha Ivy Pigott) of Broome Hall, Holmwood. Thanks to Mary Hustings of Coldharbour Local History Group for letting us reproduce the following information on Captain Gordon Hargreaves Brown’s Memorial Window. The beautiful full length stained picture glass window on the north side of the chancel at Christ Church commemorates Captain Gordon Hargreaves Brown of the Coldstream Guards, who was killed at the Battle of Ypres on 29th October 1914. Captain Hargreaves Brown was the son of Sir Alexander Hargreaves Brown of Broome Hall. The window was commissioned for Captain Hargreaves Brown’s family from James Powell and Sons on 27th October 1920 by the architect, W.D. Caroe. W.D. Caroe had overseen a major refurbishment of the east end of Christ Church in 1904 which Sir Alexander had commissioned in memory of his mother, Sarah Benedict Brown. The window was installed on 16th June 1921. It was designed for James Powell and Sons by Ernest Penwarden, an artist of note whose work can be found locally (for example in Betchworth church and St. Martin’s, Dorking) and across the country. The window has two lights, in one the figure of St. Michael astride Justice, in the other St. George astride Fortitude. An angel appears in the tracery and there are stars in the small surrounding pieces. The dedication to Captain Hargreaves Brown appears at the foot of the window. Details of the commission appear in the Powell Order Books in the archives of the Victoria and Albert Museum. 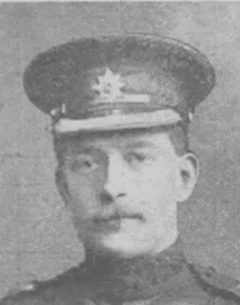 Captain Hargreaves Brown is also commemorated on the World War 1 memorial in the church.